Last Saturday I participated in a Mystery Quilt Day at our quilt shop here in Loveland. The shop runs it a bit differently from the norm, in that you sign up for the quilt and spend the whole day in the shop sewing it at your own pace. These always take place on the 5th Saturday of the month, so there will be four more this year, in April, July, September and December. Normally the shop gives out each step every few weeks or each month, but this was definitely a different way to sew the quilt. Here are the fabrics, all washed and ready for cutting! We were given cutting instructions and Step 1 of construction, so we could jump right in when we arrived at the shop. 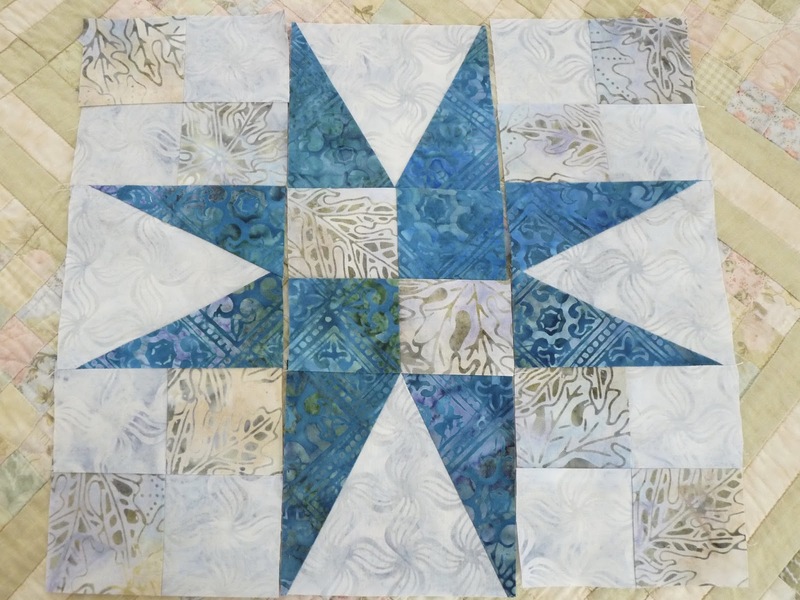 I've chosen a soft grey/blue combination for this quilt, so it will be markedly different from the bright colors in my Grandmother's Flower Garden. But as you can see, I'm currently having a love affair with batiks. 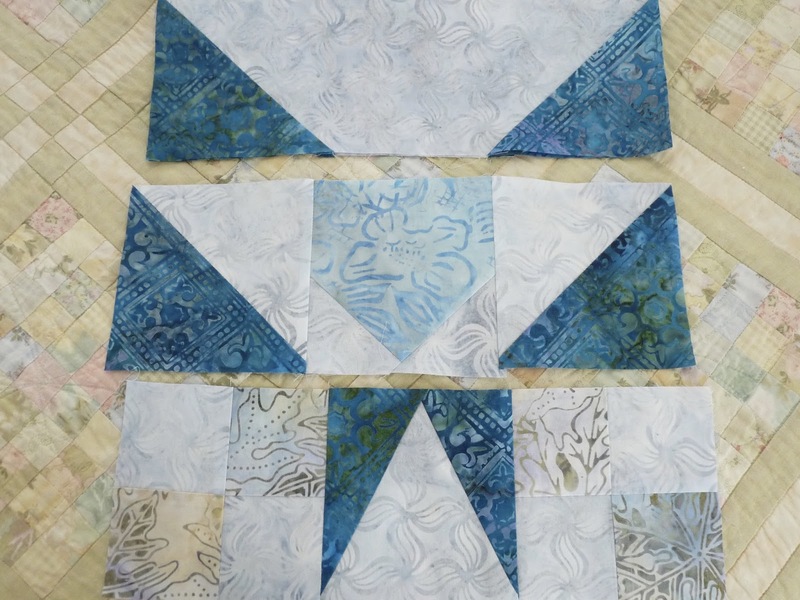 One of the very nice things about batiks is that there is no right or wrong side, so the potential for mistakes of sewing the wrong sides together is completely gone. I managed to get halfway through Step 9 of 11 steps, and this is the first block ready to be sewn together. Here are a few of the other segments that will be sewn into blocks. Oops! The segment on the bottom is in the block I've shown you above. There were about 15 ladies in the group, none of whom I knew but all very friendly. Many of the ladies were young, in their 30's, so it's nice to see the younger generation joining. Several husbands even braved the estrogen charged atmosphere to visit with their wives during the day. It was so interesting to walk around the room and see the different color combinations; there were two black and red, and another with some teal thrown in. The lady on my right had beige, two oranges and bright green, which reminded me of the New Mexico desert in the winter after heavy rains. I just don't have the color confidence to pick out a combination like that. There is a huge snowstorm on it's way tonight. Currently it is soaking California, but is expected to dump 8-11 inches (20 - 280 cm) of snow on us Sunday night through Tuesday morning. Those are some gorgeous fabrics you have there, Cynthia! I love them all. Sounds like a fun time! Very nice stitching and excellent work love the colors too! I love batiks and I love your colour choices. It will be a beautiful quilt.